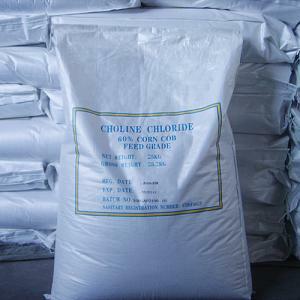 Choline chloride is a well-known and globally accepted additive for feed, which is usually classified as a B-complex vitamin. Choline plays a vital role in a number of fundamental processes in the body. It's indispensable for the bio-synthesis of phosphatidylcholine, and is a basic component of cell memberane and precursor of neurotransmitter acetylcholine. Choline usually comes in the form of choline chloride, which is the best form of choline salts. Choline as Vitamin Choline(known officially as 2- hydroxyethyltrimethyl ammonium hydroxide), although is a natural ingredient in many feedstuffs, the concentration is usually too low to ensure proper development and optimum growth in young animals, especially poultry, pigs and calves, but also cats, dogs and other furbearing animals. The deficiency of choline may cause hepatic steatosis, ophthalmoptosis, anaemia, abdominal distention, etc. 4. by building lecithin Apart from promoting the fat metabolism in the liver (the so-called lipotropic action), choline is also a methyl group source used for transforming honocysteine into the essential amino acid methionine.